That does look very nice in the Gold case! Well done. I don't think that is the original dial. 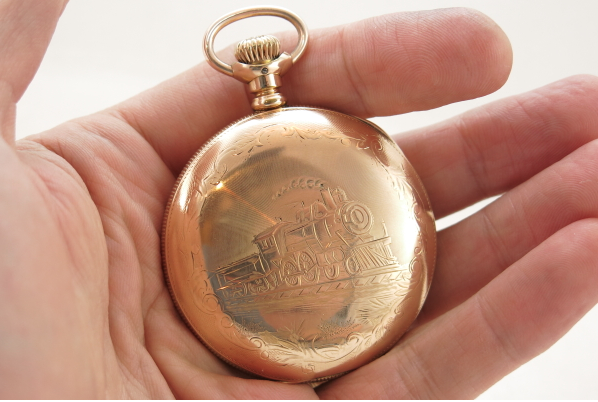 An open-faced pocket watch has the stem at 12 and sub-seconds at 6. A hunter has the stem at 3 and the sub-seconds at 6. 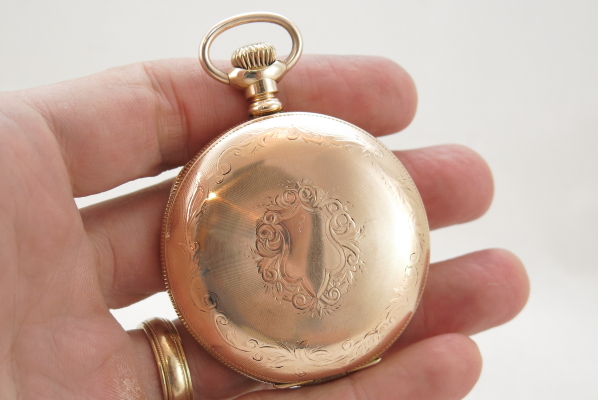 Hunter movements are frequently moved to open-faced cases, either because of style preference, or the case wore out, or selling a solid gold original case. 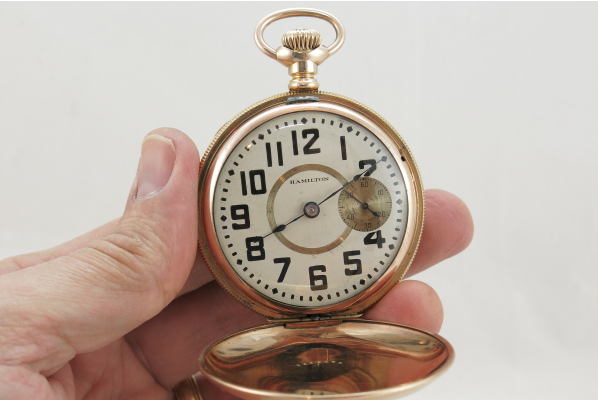 That usually results in an open faced watch with the the stem at 3 with this type of dial, which is a sure sign of the conversion. 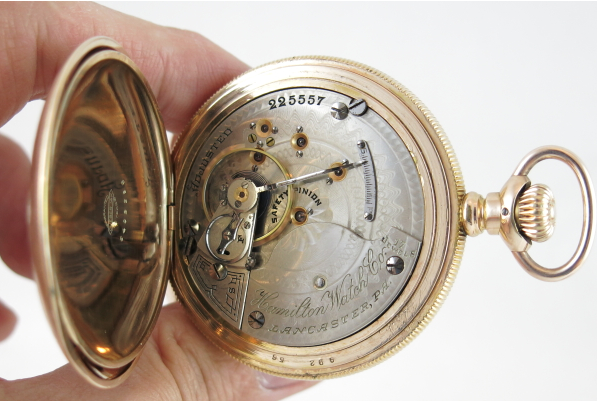 Sometimes people also swap in a conversion dial that puts the stem at 12 ... but you can still tell that it is a hunter movement in an open case because the sub-seconds is at 3 rather than 6. Yup - no doubt that it's not THE original dial... as I said, I took it out of an open faced silverode case. 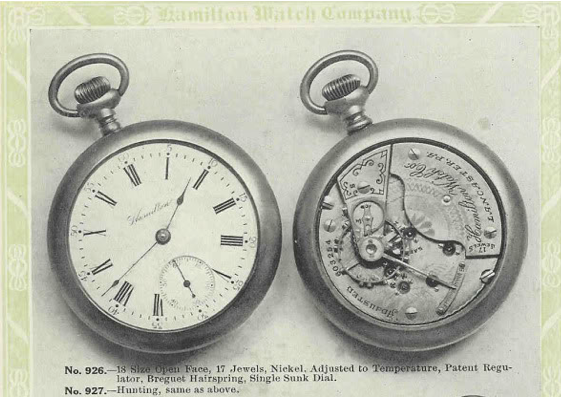 What I don't know is if the dial is AN original - meaning could a customer get a "seconds at 3" dial like that from Hamilton by picking out a hunter movement but putting it in an open faced case? Did Hamilton provide seconds at three dials? I don't know. I do know they had seconds at 9 dials tough - which is what you would get when you put an open faced movement in a hunter case. They did this with the 986 movement and early wrist watches.